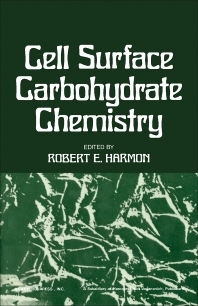 Cell Surface Carbohydrate Chemistry is a collection of papers from a symposium of the same title held in San Francisco, U.S.A. on September 1-2, 1976. The book discusses cell biology and carbohydrates, particularly oligosaccharides that make up the glycoproteins and glycolipids in the cell membrane of normal neoplastic cells. One paper discusses the involvement of membranes in the biosynthesis of glycoproteins. One author also analyzes the glycoproteins from the surface of tumor cells. The glycoproteins have complex saccharide structures similar to virus transformed fibroblasts or transformed epithelial cells. Another paper cites the concepts made by Abercrombie and Ambrose regarding distinct galactosyltransferase activity released by tumor cells. Another paper addresses a hypothetical mechanism to explain the control of cell growth by nucleoside efflux through the membrane. One author analyzes the basis for the selectivity of some cancer chemotherapeutic agents—these can also have an effect in the immunity responses of the host against cancer cells. This book can prove useful for the medically-oriented investigator, the biologist, and the scientist involved in molecular chemistry and cancer research.